Jerusalem Magistrate's Court sentenced Wednesday Moshe Cohen, a YASAM squad (Israel Police Special Patrol Unit) policeman who assaulted two Arabs in Wadi al-Joz in east Jerusalem in 2017, to 380 hours of community service. Cohen was documented brutally attacking truck driver Mazen Shweiki and another complainant, and was convicted of aggravated assault. 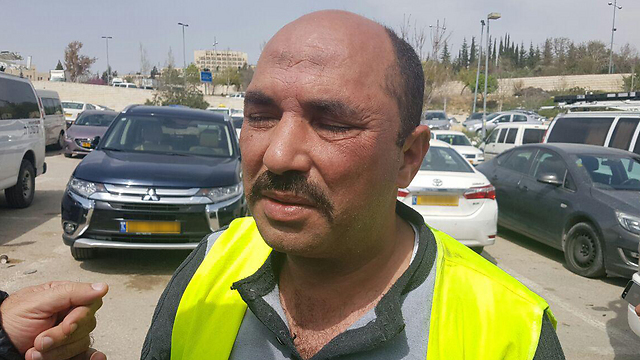 The YASAM policeman was ordered to pay Shweiki NIS 8,000 in compensation and NIS 3,000 to the second man he had attacked. The prosecutor of the Police Internal Investigations Department asked to delay the sentence in order to review the possibility of filing an appeal, saying "Following this incident, the public has lost its trust in the police." Cohen's attorney Avi Himi said that "The court's ruling indicates it has taken into account my client's vast contribution to society during his years as a policeman as well as the heavy price he had paid due to his actions, for which he expressed and still expressing profound remorse and sorrow." A video of the incident shows the police officer yelling at the man, a truck driver, with the argument later escalating to physical violence. The police officer is seen headbutting the driver, kicking him and swearing at him. The video shows the police officer also kicking another person who was on the scene. After the sentence was given, Shweiki said that not a day has gone by without him thinking about the assault. "I see a policeman and I'm afraid to come near him. Sometimes I'm afraid to leave the house, thinking I'll be beaten again. "I'm 50-years-old, a father and a grandfather and I feel embarrassed when people ask me, 'why didn't you respond when the police officer beat you?' I just want my old life back. Shweiki added that "I waited for Cohen to call me and apologize, but he didn't. I want to hear him say why he did it. I was humiliated." During the previous court hearing that took place three weeks ago, Cohen took the witness stand and apologized for his actions, adding he would like to ask for Shweiki's forgiveness. The YASAM police officer was fired from the police and went to trial as a citizen. "Since the incident I've been experiencing many hardships on the personal level, as a man and as a father of children," Cohen explained. "I consider myself as a moral person and it's hard for me to see someone else suffering, let alone when I caused this suffering," he lamented. Cohen, who served as an officer in the elite Duvdevan unit before joining the YASAM, explained that two months prior to the incident his friend was murdered by a terrorist and another friend was wounded. Several days before the assault Mazen had damaged the Cohen’s parked private vehicle and driven off. Cohen later tracked him down and initiated the confrontation. Several passersby tried to calm the police officer down, to no avail. "Get lost, all of you!" the officer is heard yelling at anyone who tried to interfere, swearing at them and threatening them as well. See all talkbacks "Policeman sentenced to 380 hours after assaulting Arab "